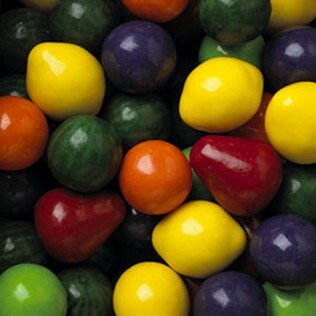 Colossal Fruit Giant Fruit Shaped Gumballs - 2 in. Humongous gum shaped like fruits are fun to display and eat. Challenge your guests to a larger than life bubble gum chewing experience! Looking for real fruit taste? Grab these giant fruit shaped gumballs for a real fruit punch. Flavors include: oranges, strawberries, lemons, watermelons, green apples and grapes. These gumballs will not work in standard gumball machines and require a 2" toy capsule machine.